Here’s shout out to my peeps in the Boston area for…tomorrow ! The Follansbee, who is getting so famous now that I will have to do extra time in PT to achieve the appropriate bow of respect, is going to be at the MFA …yes, that venerable institution of all things fine and art, to give a demonstration and talk about his unique speciality…17th Century Joinery. Wish I could be there but we were grateful for a stop over visit the other week on his way to yet another lecture. We are a couple of aging artisans, but the friendship has a patina that the antiques roadshow collectors would envy. Peter Follansbee will be demonstrating some of the techniques he uses in making reproductions of 17th-century joiner’s work. Usually done in oak split or riven from the log, this furniture most often includes carved decoration. The carvings combine geometric, floral and architectural patterns, often in combination. Mr. Follansbee has studied New England furniture in the MFA collections for almost 20 years, and will show how these designs are laid out and carved with a compass, several carving gouges and a wooden mallet. He will have examples of his reproduction furniture for visitors to examine up close, as well as resource materials to explain the complete process. Peter Follansbee began his woodworking career in 1978, learning traditional methods to build ladder back chairs. His study of 17th-century joiner’s work has led to numerous articles in the scholarly journal American Furniture, Popular Woodworking Magazine, as well as several instructional videos with Lie-Nielsen Toolworks. In 2011, Lost Art Press published a book, co-authored by Mr. Follansbee, called Make a Joint Stool from a Tree: An Introduction to Seventeenth-Century Joinery. Since 1994, Mr. Follansbee has worked as the joiner at Plimoth Plantation, a living history museum in Plymouth, Massachusetts. It’s looking a lot like this painting outside my studio this week. The skies have clouded up and the copper leaves are swirling into eddies along the edges of the lane. Glimpses of blaze orange peek from beneath neighborhood decorations and the wind is picking up. This just isn’t working. Thought it would be clever to write a Vineyard Ghost Story. Been writing and rewriting for days. A tale as told to me by Old Man Morse on Alley’s porch, late on a stormy autumn afternoon, about a seafaring captain who was never seen without a parrot on his shoulder. A story rich in long voyages on rough seas and the hint of warm trade winds and a couple of peg legged smarmy sailor types. And a dark secret. Turns out the captain couldn’t read. The bird who never left his shoulder and was often seen to whisper into his ear….was his enabler. They come one year to winter over on the island. Fierce and wicked weather freezes the harbors and the bird succumbs to the chill and passes on. The captain grieves the loss of his steadfast companion and literary interpreter. In the wake of his sadness, he decides one day to make his way along the snow covered roads to town. 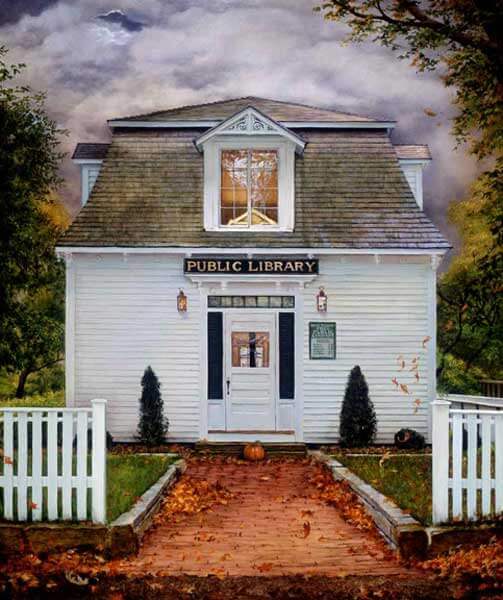 In West Tisbury he is welcomed by the lamps glowing on the library doorway. Short story shorter, the spinster librarian takes him under her wing, shameless pun, and teaches him to read for his very own self. How do I ever thank you, he says. Years ago I left my grandmother’s farm on the mainland to move here, she says, and I sure do miss her pumpkin pie. He vows to get her the gourd and when the spring comes and the harbors open he sails away returning months later with the promised orange globe. The captain walks all the way to her door only to find that the librarian had not survived a bout with the influenza. And to this day, there is one night each year, when a pumpkin mysteriously appears on the Library steps. Some even claim to have seen a ghostly reflection in the upper window on stormy nights in October. But it turns out I am not a writer of stories. I am a realist. I paint what I have come to know. These notes are mostly journal entries and serve as benchmarks along the creative path. So I turn to a higher power. One of my oldest and dearest friends Steph sent me a book at the beginning of the summer. When she was at the beginning of her chemo treatments. It is “Swimming at Suppertime by Carol Wasserman”. If you do not have this in your house right now you must go to the Bunch of Grapes and get it before dark. I have been portioning it out and yesterday read the chapter entitled Ghosts. Ms. Wasserman has found a most brilliantly simple elegant and graceful expression of the story of ghosts. I bow humbly to her artisanry and her spirit and lay the hallowed pumpkin at her feet. And I am grateful to my friend. Who is also a brilliant writer. Chronicling now her journey through a rough patch with her characteristic strength and humor reaching out to ease the fears of we who love her. And for those of you standing in the dark on this frosty late autumn evening waiting and watching at the end of the cobbled path, with scarves wrapped twice and steaming mugs of cocoa to warm your chilly hands … I offer these two lines from the end of C. W.’s story….. “Doesn’t love abide? Shouldn’t there be ghosts?” …… and maybe the odd pumpkin or two?